Notes The track has two large loops in it. 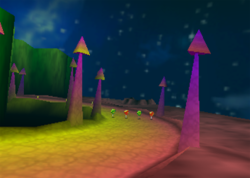 Darkmoon Caverns is an area of Future Fun Land and is in the games Diddy Kong Racing and its remake, Diddy Kong Racing DS. The track has two huge loops akin to those in Walrus Cove, although instead of having zippers at the bottom of the slide, they are zippers in themselves. The course seems to be have been battered by Wizpig's spaceships, as there are craters everywhere. Some areas have Wizpig's spaceships shooting at the ground. The course starts with a left turn, followed by a short tunnel lit by blinking red arrows on the ceiling. The road continues with a right curve which is heavily under fire by a laser. Players must avoid getting hit by swerving around it. Another short tunnel leads the racers to a section with two craters. These obstacles are avoided best following the right part of the section to take advantage of a dash panel. The track continues with a left turn into an S-shaped tunnel which is again lit by blinking red arrows. After the tunnel, players drive down a rightward corkscrew section of the track, all the while trying to dodge more barrages of the lasers. What follows is a tunneled right curve and then a left turn into a technologically paved area where the racers enter a series of loops. Immediately after the first one the players enter a short tunnel, which consists of a mound and a sharp left turn into the other loop. After this second loop, a final tunnel section going to the right leads them to the finish line. In the first curve on the right. On the left side of the curve in the laser area. Right side of the following tunnel, after the dash panel. Exiting the tunnel in the middle of the road. On the left side of the corkscrew section. At the beginning of the first loop. At the beginning of the second loop. This course's theme is one of the two tracks that is randomly played in the end credits, the other being Crescent Island's theme. This page was last edited on December 20, 2018, at 00:06.